As a little girl, did you ever fantasize about being a Disney princess? I did! I always wanted to be some sort of a princess. 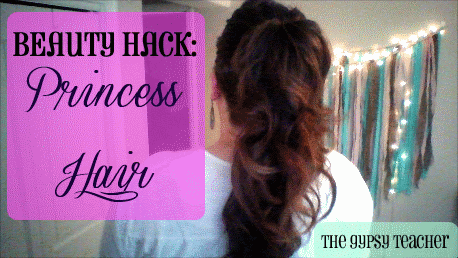 And although I can't wear frilly and sparkly dresses every day (though I totally would if I could), I've found a beauty hack so that we can have, what I like to call, Princess Hair! This hairstyle tutorial is very easy, and can be done on anyone with medium to long hair! It is best done with some curl to your hair, but I'm sure you could make straight hair work too! The key to this style is splitting your hair into two pony tails, that looks like one big one in the end. It makes for a gorgeous updo perfect for work, a night out, or shopping with the girls! Everyone will envy your beautiful long locks! And even you ladies with thin hair can pull it off, just remember the T's: Tease and Texturize! I hope you found this beauty hack helpful! If you try it out yourself, make sure to tag me on Twitter or Instagram @allieelliott! I love seeing your recreations!